You are here: Home / Interiors / INTERIORS – Thinking of a new kitchen? The report revealed that the number of homeowners choosing to improve their homes rather than move has risen fivefold since 2013. In the last five years the numbers are up from 3% of households to 15% – representing more than four million households in the UK today. Supporting the conclusion that we’re becoming a nation of improvers, UK local councils have also seen a near one third (29%) rise in the number of planning permission requests made by homeowners over the last ten years. In many of the UK’s renovation hotspots, one in every 30 or so households made a planning application last year. So why improve rather than move? What are the drivers for all this activity? For more than a third (36%) it’s about changing personal circumstances but there are also some key external economic factors, not least high property prices mentioned by a quarter (25%) as a reason to stay put. The recent changes in stamp duty are not radical enough for some with 13% believing the tax is still too much of a barrier to moving house, while the uncertainty of Brexit (8%) and rising interest rates (8%) looms large for some. In contrast to some previous studies, the bathroom is now a renovation priority with 54% of homeowners either currently undertaking an update or planning one. The kitchen is not far behind at 51%. But when it comes to growth in planning applications, loft extensions lead the way – increasing 114% from 2008 to 2017. And the cost? Today’s renovators (those with work underway or in the pipeline) have a budget of around £16,100 for each project, although one in five (18%) expect to invest upwards of £25,000. But be warned – this may well be more than many intend to spend: two in five (40%) past renovators (those who have completed projects) say they overshot their original budget by an average of 20%; equal to a cost of over £3,200. Over ambitious schedules bedevil many a project too, with over a third of past home improvers (35%) experiencing delays in project completion averaging three months. Adding to overspend and delays, two fifths (40%) of previous renovators said living in the property during the dust and disruption was the biggest test, while the problems of finding the right tradesmen and experts (34%) also featured high on the list of challenges. And a word of warning to any would-be home improver – over two thirds (65%) failed to tell their home insurer that they were undertaking a major renovation or extension meaning they could risk being uninsured in the event a project leads to a claim. A new kitchen will only lift the value of your home – and enrich your life – if it is attractive, efficient and well-installed. You may well have never chosen a kitchen before, or supervised an installation. All the more reason to shop from a kitchen specialist with an experienced design team. A local company is usually the most convenient – visit at least three before making a choice. Ask for references to previous clients, and if you can see past work. Ask if your kitchen company belongs to a reputable trade association, and how your deposit is protected. Check out guarantees. How long are they for? Are they for parts and labour, or just parts? Your designer will ask you how you want to use your kitchen – an all-important starting point. This expert will guide you through current technologies for food preparation, cooking, storing and so on. They will be well-informed on new developments in labour- and energy-saving. But above all, a kitchen specialist will help you design your kitchen. They will spend time listening to your needs and aspirations, and then turn your thoughts – however muddled – into a functional and attractive room. Allow yourself plenty of time to develop your ideas with your designer, who will have lots of creative input along the way. 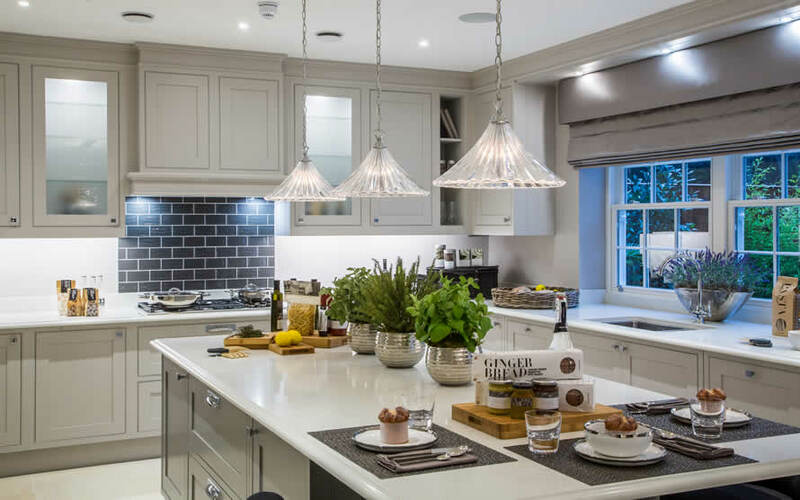 It is a mistake to rush the planning process which often takes longer than creating and installing a kitchen itself. Experts say that it is not uncommon for the “design” stage of creating a kitchen to take as much as six months. Nevertheless, it is important to get your eye in, and acquire a few basic facts, before approaching a designer. First of all, make a list of what you don’t like about your present kitchen. Then start collecting ideas on what would make you happy. Notes on the basic fundamentals are below. Start a file of brochures and tear pages from magazines. Save/print pages from the web, and start/share boards on Pinterest. Follow Instagram accounts that catch your eye. Explore the website www.housezz.uk which shares ideas on home improvement, helping to find products and suppliers worldwide. This preliminary homework will help get your kitchen discussions off to a good start. One word of advice here: never commit yourself to any colour or material until you have seen a sample – computer screens and printed pages cannot give you an accurate idea of colours and textures. Kitchen units: Your kitchen cupboards are the basic framework around which your kitchen is constructed. It’s the doors we see – inside is the vital storage that holds our kitchen kit. Think about the amount of storage space you will need for food, pans, tableware and small appliances. Make sure you can access every part of it. Place wide pull-out pan drawers between the sink and the hob and allow enough surface space for the kettle and toaster. You might opt for a hot water tap which delivers kettle hot water on demand, or a filtered water tap, to reduce clutter on work surfaces. A batterie de cuisine with rails and hooks makes for a homely feel, with all your cooking utensils and pans on display so that you can easily find them. A popular finish for doors is lacquer – buy a good quality and this will not date. Handmade kitchens in wood tend to have painted doors – you are less likely to tire of a gentle shade than one that screams bright, bright, bright. This type of door is easy to revamp with simply another coat of paint. Wall units with solid doors, often make a kitchen appear smaller, so consider glass-fronted doors for a lighter feel, or combine them with open shelving, to show off your prettiest china, or copper pans. Mid-height and full-height units can house built-in appliances as well as provide extra storage space. If you have room, a larder cabinet is currently popular – be it slim or cavernous/double-doored. Choose one that makes the most of all the available space, with adjustable shelving in the body of the cabinet, drawers beneath and shelving racks on the door insides. If possible, have a separate utility room. Kitchen islands: The kitchen island is the modern feature most people want. It provides the perfect link between sink and appliances, the eating area and living spaces. You must however have enough space to walk around it, if your kitchen is to function properly, and avoid looking crammed with cupboards. Have at least a 90cm to 120cm wide walkway in high traffic areas around the fridge, hob and sink (which should also be close to each other) – aim for a space where two people can pass each other comfortably. And don’t forget to allow opening space for the dishwasher (www.realhomes.com/buying-guides/the-best-integrated-and-freestanding-dishwashers) and cupboard doors and extending drawers. Adding a sink and/or hob allows the cook to face sociably into the room. You could have a small sink for food preparation, leaving a large sink for soaking/ washing up large pans and so on. You could make a statement with a striking rotating spring neck or an unusual finish, to add a focal point. Remember that these more sophisticated islands will need electrical connections, and probably plumbing and maybe gas. In a small kitchen, an island can be little more than a well-positioned sideboard, but at a comfortable height and with a well-finished back panel (this could even be a mirror for a space-enhancing effect). For a larger kitchen, consider an L-shape. Or lower part of the island to create an eating area, or go lower still for a comfy seating nook. Combine different surfaces – maybe wood for the eating area, and a hardwearing quartz for food preparation. Appliances: Don’t compromise on the quality of your appliances and keep worktops clear by creating a space for everything from food processors to bread makers. Work out where any ‘extras’, such as a chill blaster, vacuum sealer, boiling water tap, wine fridge will go. Or even the second dishwasher which is in demand at the top end of the trade. Cookers in particular are now very complicated offering a wealth of different features. It’s probably best to think about how and what you cook, and work backwards from there, rather than be tempted by a lot of add-ons you never use. Look at robust build and controls. Wherever possible, test out equipment before making a choice. Some appliance makers such as Gagganeau, Miele and Smeg, have their own showrooms where you can go and “test cook” for example. They may even offer cookery lessons that show off their latest technology. Exhibitions such as Grand Designs and Ideal Home are also useful for ideas and demos. If you prefer built-in appliances, then consider placing a single or double oven in a tall unit as they are more convenient to use at this height. Remember that front-loading appliances, such as ovens and dishwashers, will require extra space in front of them. Free-standing appliances such as big American-style fridge freezers and stand-alone wine cabinets can be an attractive departure from the fully-fitted look. Sinks: The sink, the cooker or hob and the fridge – basic components of any kitchen – should be laid out on three points of a triangle at a comfortable distance from each other, with an uninterrupted passage between them. A compact “work triangle” of this type cuts down on time spent walking between key areas, and minimises accidents caused by a collision between rushed people, who may have their hands full, or be carrying a pan with boiling water, say. There are three main ways to fit a sink into your worktop – under-mounted, top-mounted and integrated. For a sleek look, go for an under-mounted design, fitted below the worktop, with the rim concealed, leaving no edges on show. Such sinks are easy to clean, but are often heavy and need a strong worktop. And they need a skilled fitter. A top-mounted or drop-in sink has the bowl fitted into a pre-cut hole in the worktop, with the edges on show. This is a cheaper option which is easier to install. But the exposed edges can trap food and debris, and need sealing well to make sure they are watertight. An integrated sink is made from the same material as your worktop, in one seamless stretch. Sinks like this look luxurious and are super-easy to clean – but they are expensive, and if you damage them in one spot, you might have to replace the whole worktop. As for sink materials, there are quite a few. Stainless steel is the most common choice. It’s affordable and very hardwearing – one company, Franke, even offer a 50 year guarantee. The silvery colour fits in well with most styles of kitchen cabinet and worktop. For a more traditional farmhouse look, go for a ceramic sink – a deep bowl will make it easy to wash large pans and oven shelves. But, again, such sinks are heavy, and so need sturdy cabinets for support. Ceramic sinks stain easily so will need frequent cleaning. Composite sinks are made from a mix of ground granite and acrylic resin, moulded under high pressure. Durable and scratch-resistant, they come in lots of shapes and colours. They are however very obviously “man-made” and look best in a contemporary setting. You could also consider a copper sink, which acquires a patina over time. Copper is naturally antibacterial, durable and easy to clean – but hot pans and utensils, acidic foods and harsh chemicals could all cause damage. Worktops: You will use your kitchen worktops for preparing and serving food, and possibly even eat off them. They are one of the most dominant features of your kitchen, so it’s important you really like them visually. Ideally, there should be an area of work surface either side of the sink and hob. The height of worktops should suit whoever does the cooking – that may mean having two worktops of different heights – and any cupboards should be easy to reach. Consider a worktop at a height for sitting down to do lengthy tasks – vegetable preparation, for example, or making cakes. Built-in recycling bins can have a “chute” from your worktop which goes straight into a bin for food waste. Worktops have to withstand (possibly floods of) water, high heat and regular, intensive cleaning. Currently, granite is a popular choice – a naturally occurring material with every piece unique. Colours range from inky black to pale pinky shades, in a variety of mottled effects. A granite worktop is heavy so will need to be well supported. When properly sealed, granite resists stains, and stands up to heat. And it’s very easy to clean. The drawback is the expense. A fuss-free alternative is a man-made composite material, such as quartz or Corian, made from a mix of natural minerals with resin. These are highly durable, non-porous and easy to clean. However, these also can be costly and require specialist fitting. Newer types of ceramic worktop can have an induction hob built in – another advance in kitchen technology. But for that natural look, hardwood is difficult to beat, and reasonably priced compared to, say, granite. There are lots of shades of brown and types of wood grain to choose from. But a wood worktop needs regular maintenance – including treatment with a special oil at least one a year. Wood can stain and scratch, or even mark under a very hot pan, but after a while this becomes a patina that adds to its attraction. You could add a cool marble slab for pastry-making. Stainless steel for worktops is common in commercial kitchens and is perfect for that popular industrial style. It’s strong, durable, waterproof, easy to clean, and very light. You can have sink and worktop all in one piece. 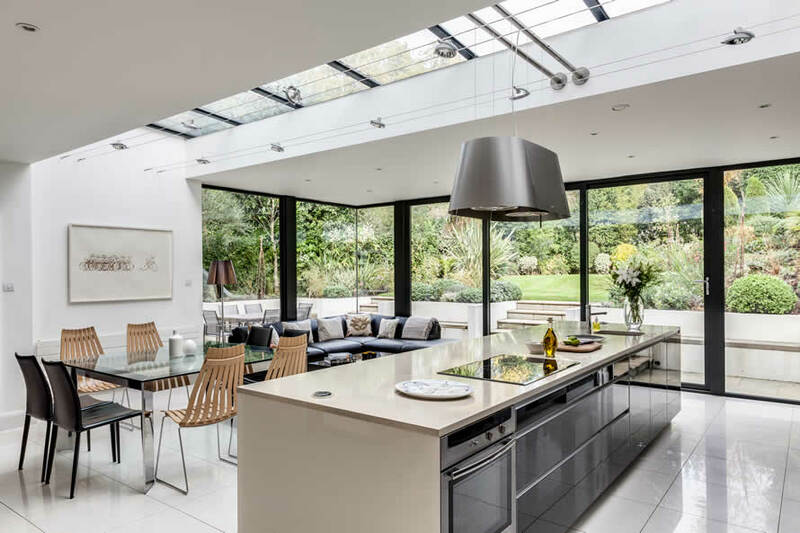 However, this ultra-smooth gleaming metal can look rather bleak over large areas – but you could use it for a feature such as a kitchen island. Lighting: Good lighting lessens chores and lifts mood. Plan it at an early stage – you will need ceiling and wall points. Think in terms of zones for various types of working/living. You’ll need general overall light across the whole room – probably ceiling downlighters in zoned circuits, dimmable at different levels for cooking, dining and entertaining – recessed spotlights are simple, unobstrusive and often adjustable. But pendants can also do the job, and add a decorative touch – or even a bit of drama, a chance to make a statement. Consider a matching row above a kitchen island, for example, or over a work surface – keep the shades small and neat with the light directed downwards. You could also have display lighting for glass-fronted cabinets, and if you have open shelving, think about fitting LED strips along the edge to cast a glow on the objects on display, spreading out subtly into the rest of the room. You can fit task lighting under wall units, which will illuminate working areas without a shadow. Lighting above wall units can bounce off ceilings for a gentle even effect. Low level lighting, like plinth lights or lights set under breakfast bars, can create a soft wash and bring out the texture and pattern of floor and door surfaces. This low-lit zone makes for a relaxing atmosphere – and you can leave the lights on at night for finding your way to make a hot drink or to raid the fridge.